Studies have shown that there’s a connection between eating leafy greens and reducing your risk of glaucoma. In fact—leafy greens have even bumped carrots from the top spot as the food to eat for better eyesight! So if carrots were never your preferred vegetable, research now tells us that we have many more options available for eye health. Leafy green vegetables are powerhouses of vitamins and nutrients, and are an important addition to a meal at least once day, though the more that can be eaten, the better. Nitrates, which are found in high amounts in leafy green vegetables, help blood vessels relax, which improves blood flow and lowers blood pressure. This is important because glaucoma causes damage to the optic nerve due to intense pressure that builds up behind the eye. Vitamin C, vitamin E, vitamin A, and zeaxanthin are all found in leafy greens and can help protect the eye from the risk of glaucoma and other causes of macular degeneration. Glaucoma affects about three million people in the United States and is the leading cause of blindness. A recent study published in JAMA Ophthalmology found that higher nitrate intake from leafy greens was associated with a reduced risk of developing primary open-angle glaucoma. Iowa State University assistant professor and ISU Extension nutrition specialist Sarah Francis says that dark leafy greens like spinach, kale, and chard can help reduce the development of age-related macular degeneration (AMD) because they have high amounts of lutein. Lutein is an antioxidant found in carotenoid-rich foods and leafy green vegetables; it can help with eyesight, and is stored in the eye itself, in the macula. Food nutrition guidelines strongly suggest we consume five servings of fresh vegetables a day, including leafy greens packed with vitamins, nutrients, and phytochemicals that are key to fighting off disease. Adding leafy green vegetables to your diet is incredibly easy given the assortment of vegetables available at the market year round. Eating seasonal, local produce is optimal, and many green vegetables are in season for most of the year. Research has shown that kale and collard greens were by far the most beneficial in reducing the risk of glaucoma, so start with these two dark green leafy vegetables. They don’t have much flavor on their own, but they adapt to whatever they’re cooked with, so throw them in some soup or a stir fry. Other vegetables that do a good job of warding off AMD are cabbage, celery, spinach, radishes, green beans, and beets. Beets might seem odd because they are more red than green, but they have long leafy green stems that can be eaten as well. Turnip greens are an excellent source of vitamin A, which helps eyesight. Broccoli is another powerhouse green vegetable loaded with vitamin A, vitamin C, and folate. 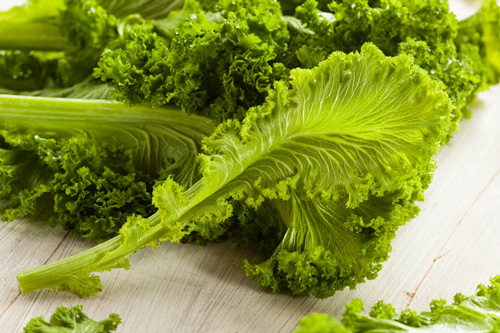 With such an abundant variety available, eating leafy greens to improve vision is easy. Find three or four go-to powerhouse vegetables to eat daily, and give yourself some protection against macular degeneration. Eating carrots is no longer only what the doctor ordered—grab some kale, cabbage and broccoli, look up some recipes, and start enjoying these wonderful vegetables for the nutrition they offer and protection against glaucoma. Kang, J.H., et al, “Association of Dietary Nitrate Intake With Primary Open-Angle Glaucoma,” JAMA Ophthalmology, January 2016. doi:10.1001/jamaophthalmol.2015.5601. “Eat These Veggies to Improve Your Website,”One Green Planet web site; http://www.onegreenplanet.org/natural-health/veggies-to-help-promote-good-eyesight/, last accessed February 24, 2016. “Can Dark Green Leafy Vegetables Save Your Eyesight?”Iowa State University Extensions and Research web site;https://www.extension.iastate.edu/news/2010/mar/120301.htm, last accessed February 24, 2016. “Green Leafy Vegetables to Lower Glaucoma Risk,”Mercola web site;http://articles.mercola.com/sites/articles/archive/2016/02/01/vegetables-lower-glaucoma-risk.aspx, last accessed February 24, 2016. “Leafy Green Vegetables: How Food Affects Health,”Joy Bauer web site;http://www.joybauer.com/food-articles/leafy-green-vegetables/, last accessed February 24, 2016. “Keep Your Eyes on Those Leafy Greens,” Los Angeles Times web site;http://articles.latimes.com/2008/jan/21/health/he-eye21, last accessed February 24, 2016. “Best Leafy Greens,”The Science of Eating web site;http://thescienceofeating.com/vegetables/best-leafy-green-vegetables/, last accessed February 24, 2016.